iPhone Settings “App” Slow to Load? 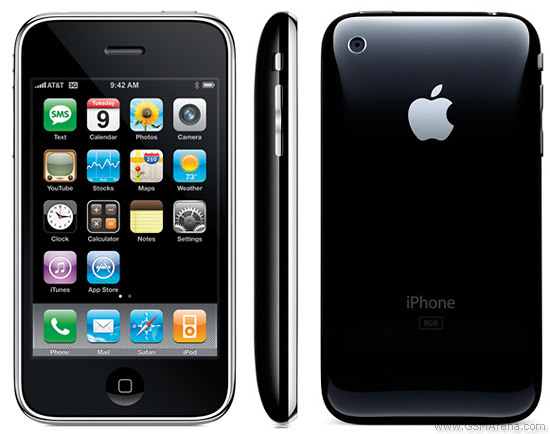 Recently I had started to notice that the Settings app on my iPhone 3GS was really slow to load. It was probably taking 2-3 seconds to load up. This was a pain especially when I wanted to adjust the brightness on my iPhone so I could use it as a flashlight. Silly I know, but its damn useful in a pinch. Anyway, I started to think that the issue was how many applications I had installed on my phone and also how many of them installed a settings widget on the phone as well. Flipping through the 6 or 7 pages of apps I had installed on my phone I decided that half of them I never used or had only used once or twice to play around with them. So I removed a bunch of them. Turns out, I was right. More times than not, the Settings app loads right up with very little waiting at all. I know that 2-3 seconds isn’t really that long, but when you’re impatient, it can seem like forever. 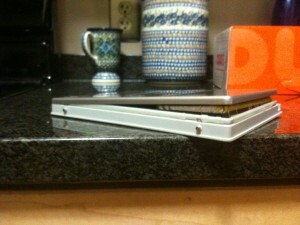 This entry was posted in Apple, iPhone, iPhone 3GS on May 13, 2011 by bill. Each program found different issues with the system and I was able to remove some nefarious programs that were causing his issues. I also ran CCleaner from Piriform which allowed me to remove any unwanted files from browsing the Internet as well as removing any unnecessary Windows Registry entries. At this point, I figured that the system was clean so I gave it a reboot. I logged back in to Windows in normal mode and used his Windows account. The Windows 2011 Security Center spyware was gone, but something else had happened in the process. Even though Windows had Automatic Updates turned on, I was getting a popup in the toolbar suggesting that it wasn’t. This lead me to believe that there was still some spyware installed. So I ran the above utilities under his username to just make sure I got everything. Nothing. I ran installed and ran Windows Defender first. After the install, I couldn’t update its definitions, which I thought was odd. So I installed and ran the Malicious Software Removal Tool. 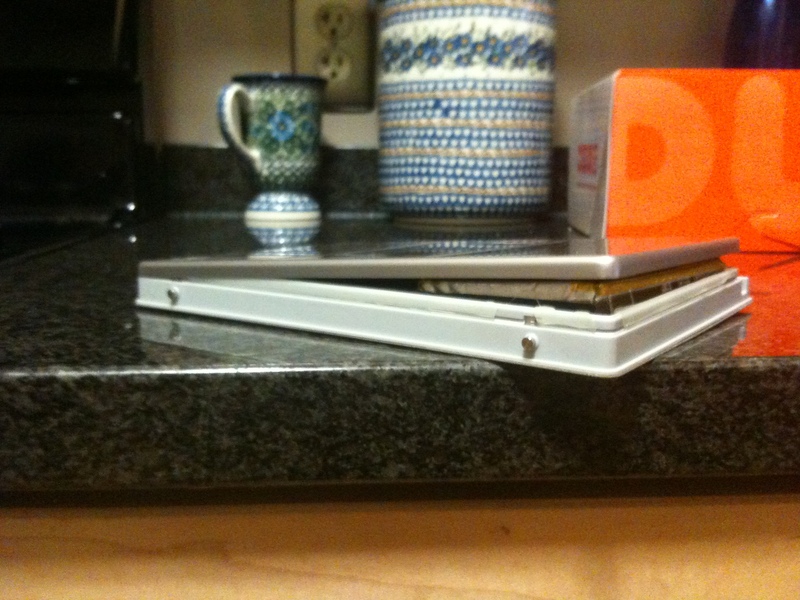 It didn’t find any more spyware. At this point, I was pretty confident there wasn’t anything else wrong with the system in terms of spyware or viruses. To get the Windows Defender definitions to update, I ran Windows Update manually. I selected the updates to install, but none of them worked. 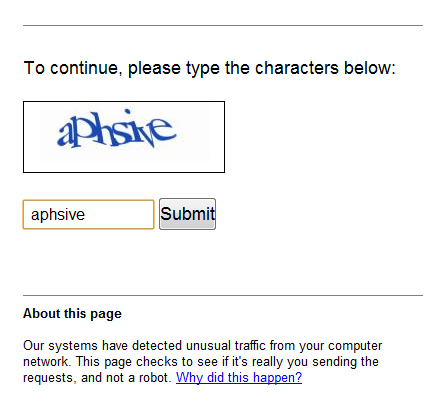 Now I was starting to think that whatever spyware that was installed, had hosed the system. So back to Google I went to search for a solution. I found this Microsoft Knowledge Base article outlining some steps to take to get Windows Update to work again. I was a little wary of running some of the scripts they recommended, but I figured it came from Microsoft so it might be worth the risk. Besides, his computer was still sort of hosed. I followed each step in order, then rebooted the system. The Windows Update alert in the toolbar was gone, but Windows Update still wasn’t quite working. Some more searching lead me to another Microsoft Knowledge Base article outlining how to obtain the latest version of the Windows Update Agent. I downloaded this (x86 in my case) and installed it. I rebooted the machine again and crossed my fingers. Low and behold, upon restarting, Windows Update and Windows Defender definition update worked. All because of a little spyware that was installed. Bottom line folks, don’t click on or install any sort of security popup you see online. They’re bad news. The first one verifies the disk and makes sure its not marked as dirty and the second actually runs through any repair steps to make sure the disk is in good order. Anyway, a lot of work to fix one silly issue. I’m just glad that I was able to remove the spyware and get the laptop to work properly again. This entry was posted in Spyware, Windows, XP on May 11, 2011 by bill. 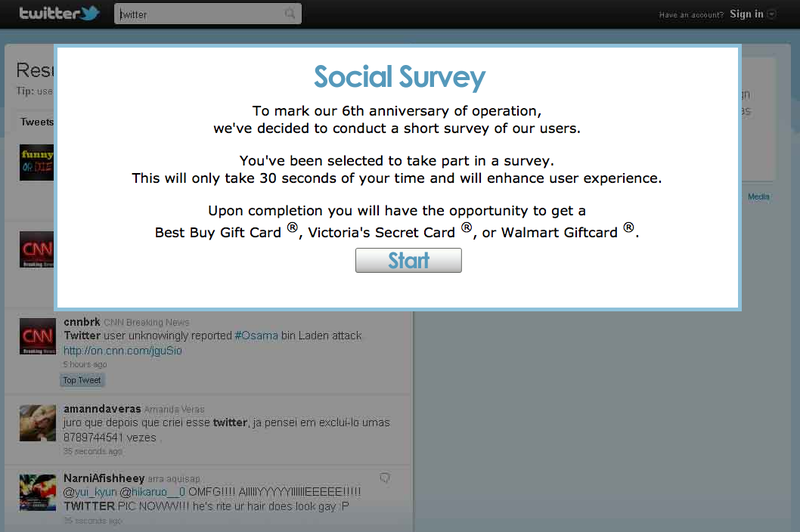 It looks like its a survey site looking to gain access to email addresses. They made the site look legit enough to make a lot of people probably think its really Twitter interested in a user’s input, but it’s not. After you answer 3 simple questions, you’re asked what you’d like to be entered to win (iPad 2, Victoria’s Secret Gift Card, or $1,000 Gift Card). Obviously you’re not going to win anything, but the site owner will certainly take your email address and sell it to make a tidy profit. Users beware. This entry was posted in Social Media, Twitter on May 3, 2011 by bill. Massive tweeting on your part probably won’t have much effect on any traffic sent your way on Google’s part. I honestly don’t think Google will take the text from a tweet just on face value. I believe they’ll use that in conjunction with other metrics when placing a value on the importance of a tweet. Your followers will probably play an important role in the effect of tweets. Just like how similar web sites linking to your site help with your ranking (based on keywords, linking, etc. ), the same will probably be said for your Twitter followers. For instance, if you’re into Ford Mustangs and you promote your Ford Mustang site on Twitter, other Ford Mustang related Twitter accounts will be more valuable to you than a Twitter follower who’s all about Britney Spears. Makes sense. The depth of your tweets will mean the most. What I mean is, how many times does your tweet get re-tweeted? By having a tweet re-tweeted a ton of times basically means whatever you had to say started to really catch on and people thought it was important. More value would be placed on a tweet Google could tell the social network found important. A combination of all of the above. I’m not sure anyone has any solid idea on how Google is going to use Twitter data. My guess is they’ll use a combination of my assumptions above when placing a value on anything it gleams from Twitter. 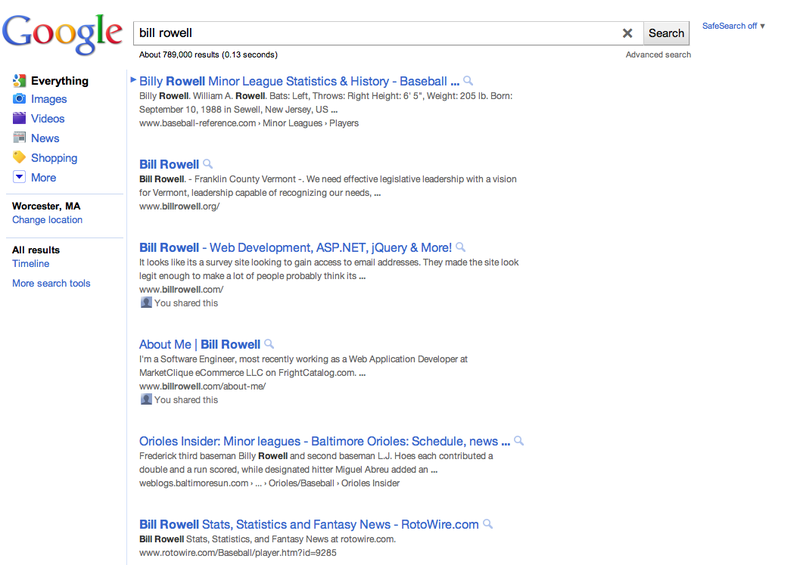 What’s almost certain is Google appears to be applying more metrics to its algorithm. Whereas domain names, inbound links, domain age, etc. was of utmost importance several years ago, Google is going to look into more metrics when applying your search rankings. In my opinion, this is a good thing. 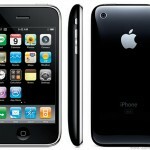 At the end of the day, it puts more relevant topics first based on how people are using the information across the web. Only time will tell what the importance of these changes will be though. What does everyone else think? 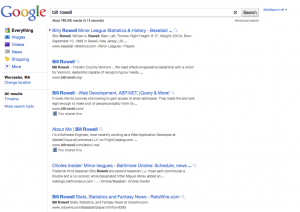 This entry was posted in Google, SEO, Web Development on April 12, 2011 by bill. 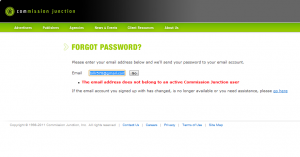 The email address you have entered is associated with an existing account. 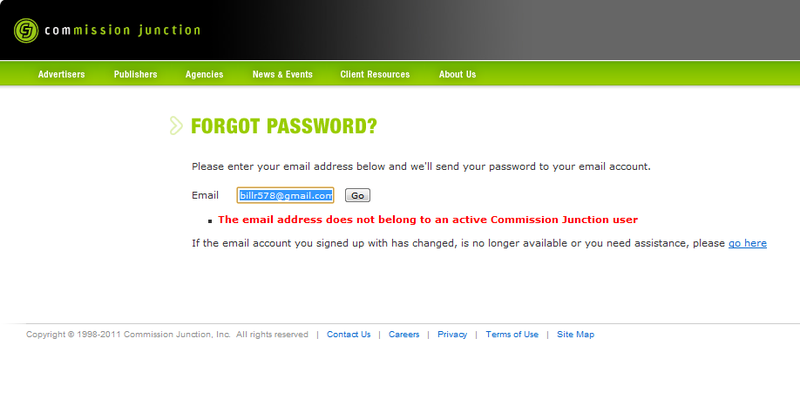 Please use another email address or log in to your existing account. 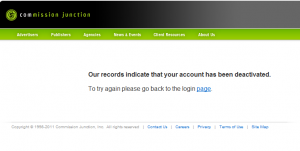 Our records indicate that your account has been deactivated. To try again, please go back to the login page. I’m baffled at this point. First, why can’t CJ get some consistent messaging going on in their system. 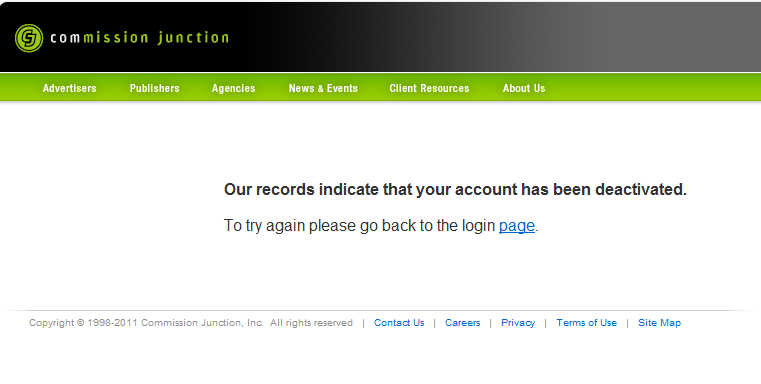 Second, why would I try to login again if you just told me that my account was deactivated? How would trying again fix that? 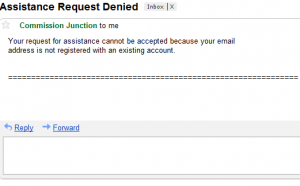 Your request for assistance cannot be accepted because your email address is not registered with an existing account. Gaaaaaah! Really CJ? I have an account. Your system keeps telling me it’s not active. 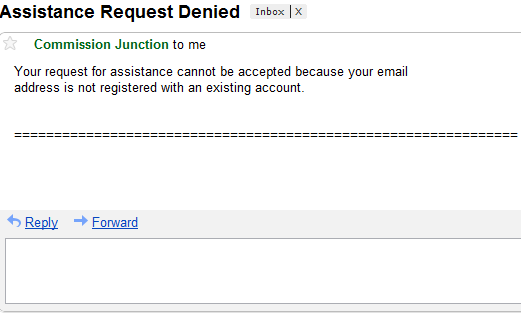 Then how can your email system tell me that my account doesn’t exist? 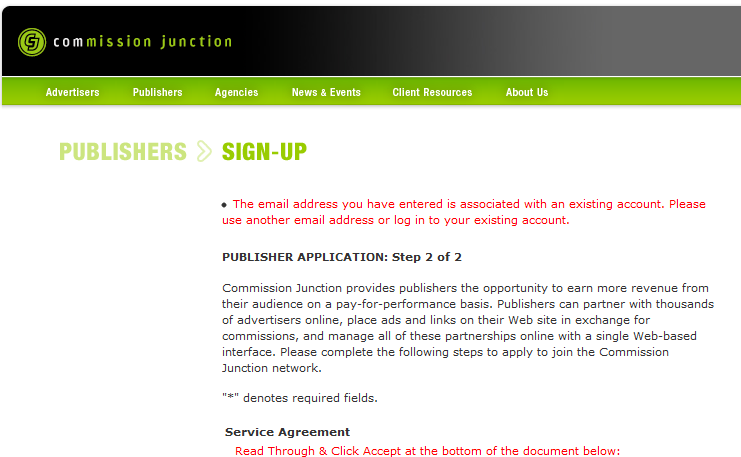 Apparently Commission Junction just doesn’t care about small affiliates or to even have a system that actually gives you some useful information. I suppose I could call them to try and have this resolved, but at this point I’m just not interested. I’ll set up a publisher with another affiliate system like ShareASale. 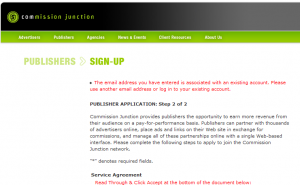 This entry was posted in Affiliates, Commission Junction, ShareASale and tagged Affiliates, CJ, Commission Junction, Commission Junction Support, ShareASale on April 12, 2011 by bill.